Make a special personalised visitors book printed with your photos, unique designs and messages. The satin fabric hardback cover displays your images beautifully and adds that premium-feel that will impress your guests. Your photo guest book can be A3, A4 or A5, suiting a whole host of situations and businesses. Choose ruled or non-ruled 160 gsm pages. Your beautifully hand bound personalised visitors book is a wonderful addition to your wedding ceremony, B&B business or even Christening. Your photos are printed onto the luxury satin hardback covers, producing a wonderful premium feel. There are four sizes to choose from, and the inside pages, at a luxuriously thick 160 gsm, can be ruled or left blank, allowing for total customisation. Impress guests with a custom guest book, showcasing your original designs. You have four box or tin options; none, silver tin, black cloth box, or a personalised presentation box. The personalised presentation box will showcase the beautiful design that you have chosen for the front cover of your custom guest book, printed onto Suede Vision fabric and wrapped around the lid. Love the guestbook and I received it almost before I ordered it ! I ordered a personalised guest book and have to say that I was very impressed with the quality, the photo reproduction, the overall appearance of the book. It far surpassed my expectations. Not only that, but it was delivered within a few days. Would not hesitate to recommend this company. A lovely keepsake. Quality excellent. Photos printed on silk front & back covers excellent too. The only thing I would advise is to select a standard font when adding text to either cover, only because I selected a very fine, fancy text which appears slightly blurred to the eye, however, this doesn't detract from the quality of the product. Care: Wipe clean with a slightly damp cloth. Keep the pages away from water to prevent them from being damaged. Your personalised visitors' book is made with a hardback Monroe satin cover, printed on both sides with your unique photos. This luxury fabric gives the guest book a classy, premium finish, instantly impressing your guests. We use a specialist printing process that fuses the ink deep into the satin fibres, ensuring your designs are long-lasting and won't crack or peel. The Monroe satin is a woven fabric, so the natural weave is visible through the print, enhancing the authentic charm of your photo guest book. The spine comes in six colours; black, blue, green, red, pink or grey, and the pages can be ruled or left blank. We finish the book with smart metal caps secured to the corners, for that polished finishing touch. We then print your image onto our luxurious Suede Vision fabric and wrap this around the lid of the presentation box, so that not only your guest book is personalised but so is the box that it is supplied in. Because of the woven satin fabric, the weave is visible through the print, which adds to the charm. However, to ensure the best results, we suggest choosing designs with bold, big details, as smaller, more intricate features might not be as sharp. The front and back cover are designed individually, allowing you to print two different designs on each side. This is ideal if you're creating a personalised visitors book for your bed & breakfast, hotel or art gallery business as you can print your contact details and business information on the back for a professional touch. If you are arranging a special birthday party or hen party, a great idea is to have a personalised birthday photo guest book made especially for the event. All the guests can write something on the pages and you keep it forever, making a great memory keepsake too. 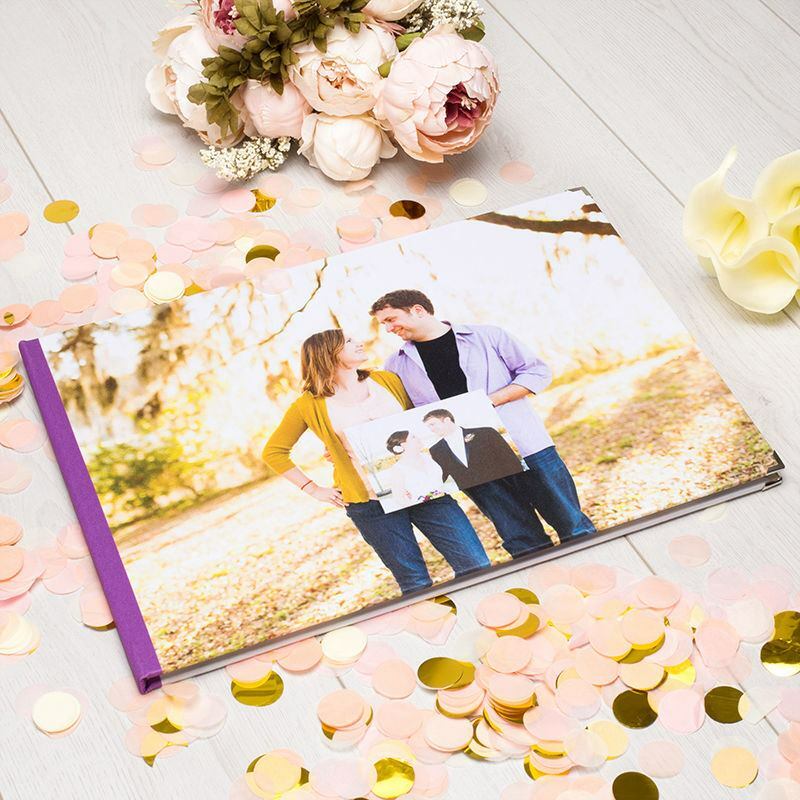 One of the most popular uses for this book is as a wedding guest book. Make a custom wedding one to record all the visitors and their comments on your special day. You can reminisce on your first anniversary and cherish the memories forever. Add a special touch to your guest house and design a personalised visitors book. When guests check out, they can leave a message for all your future guests to read and be inspired by. It's a classic tradition that still prevails to this day and enhances the authenticity of your B&B.